I hope you are all doing well, not long until the weekend now! 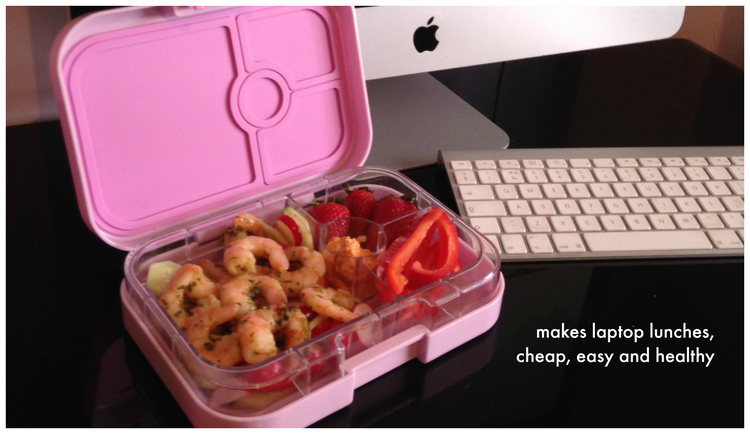 In keeping with my latest posts around healthy living I wanted to introduce you to my Yumbox* which travels with me every day to work. The main benefit to this product for me is that I reduce on packaging, I don't need to use plastic sandwich bags or foil or anything to keep my food in and I can just pop it all in my box which can slot straight into my handbag. In terms of convenience it definitely delivers. Did I mention it comes in colours including this super cute pink?! Inside the Yumbox you have pre-portioned removable trays and illustrations which give you ideas for what to put in each compartment. There are two designs, the classic Yumbox which has five 1/2 cup portions with a small well to store a dip or treat, the panino is the one I have and that one is split into two a large two cup portion and two 1/2 cup portions with a dip well too. In terms of what you choose to put in each section, I like to put either a sandwich thin in the main compartment or cooked meats like ham or roast beef, I then have fat free yogurt in the top right, nuts or berries in the dip well to add to the yogurt and then I'll have apple slices or sweet potato chunks in the bottom right. You can have whatever you like though, if you just want to have a sandwich and some fruit you can take out the tray and just have that so it's adaptable. Another one of the features is the leak proof single lid which means you can have yoghurt next to your sandwich without the worry of anything creeping over into another compartment which I thought was really good. I would say the Yumbox is equally as suitable for adults and children, the fun colours and illustrations are great for engaging children with healthy eating and cutting out packaging but as an adult I thoroughly enjoy using mine and it looks fab in the office fridge. I would definitely recommend it for any of you guys that are in the market for a new lunchbox, it's a handy size, nice and secure and great quality. If you want to check out the Yumbox range you can do so on http://www.eatwell-uk.co.uk/ who are the exclusive Yumbox distributor for the UK and Ireland. Let me know what you think of the product in the comments below, I'd love to hear your thoughts.